Stokke, Bugaboo? Stokke, Bugaboo? Stokke, Bugaboo? It’s the question that plagues many a parent-to-be. Get it wrong and you’re stuck with your very, very expensive pram for a very, very long time. So we can’t believe that somebody hasn’t thought of this brilliant idea before. Melbourne-based nursery store Bebe is giving parents and prospective parents the chance to test-drive these two immensely popular prams. And we’re not just talking a quick spin around the store. No. Bebe will let you take the pram out for an entire morning or afternoon. So you can check if it fits in through the door of your favourite café haunts. Or through your own front door, for that matter. You can try wheeling it down the aisles of your local supermarket. Have a go getting it on a train, tram or a bus. Or even just into your own car boot. Visit the Bebe site to find out more or to book your own pram test-drive. Bebe, based in South Yarra in Melbourne’s south-eastern suburbs, also have a baby carrier and sling library so parents can try the most popular brands at home for up to ten days. 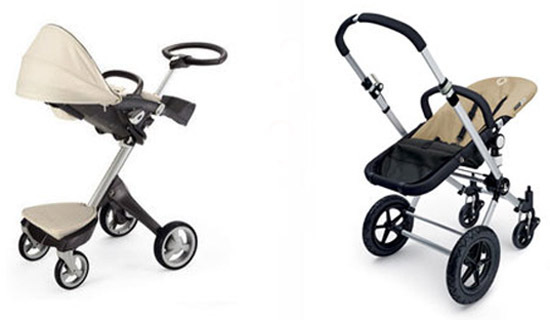 If you’d like to compare the features of these two prams against each other or with other prams on the market, please check out our fabulous Chooser.